Grading… In Education Reform circles is there an issue that is more controversial than grades? I have seen advocates for standards-based grading, mastery based grading, micro-badging or credentialing, and most frequently just throwing out grades all together (follow #ttog for more on that). The only thing that reformers seem to agree on is that traditional grading systems have more drawbacks than benefits. As a starting point to this post/discussion I want to assume that teachers are acting in good faith and are trying to do the best for their students. I think that what often gets overlooked in many of the great grading debates are the pragmatic trade offs that come in every classroom. I’m sure there are exceptions, but most schools require some sort of grade and these can have serious consequences for a student’s future. GPAs are required for college and scholarship applications. In my state of South Carolina, students can receive scaled levels of funding based on a grade or class ranking. Parents and students expect some form of grade too. Thinking of my grading system was not a priority for me when I started teaching. I had assumed that grading had to be a traditional category weighted system. At the most radical a teacher could use a points-based system. At the start of my career I was stuck in the “but that’s the way its always been done” mentality. Sadly, traditional grading systems are what many teachers, parents, and students still expect. An overused term in ed circles is “stakeholders”, but in the case of a grading system, we really do need to get the stakeholders – parents, the teacher, administrators, and students – all on board and deeply understanding the scheme. A grade should be an indicator of Progress and Growth towards mastering the skills of the class curriculum. A grade should be quick and easily understood illustration of the student’s growth and progress. With these goals in mind I have developed a modified version of the typical XP or Level Up grading system. From my understanding, the original XP grading system can be found in Lee Sheldon’s “The Multiplayer Classroom”. This is a classic work of the gamified classroom and I highly recommend reading it. Based on Sheldon’s system and my understanding of various gamified grading systems I have tweaked my system but use the following principles as a guide. Students ‘level up’ in to their grade. There is no complicated mathematical formula. Earned XP leads to level gains which leads to the grade. XP is not awarded for behavior. I have alternative system of “GOLD” to reward behaviors. XP for assignments is openly published so students can plan a strategy for their activity and assignment choices. Grading does not equal feedback. Formative assessment and feedback is an ongoing process and not every assessment will be graded. Offer more XP than necessary to achieve a maximum score. In my system the ‘top score” is 10,000XP but I will offer well over that. While I have never calculated the total offered it must approach 20,000XP. Keep the gradebook flexible to maximize student choice in assignments. Students start at 0XP and earn XP for the assignments and activities that they successfully complete in class. These are often called “missions” in my classroom but in other gamified classrooms might be called “quests”. 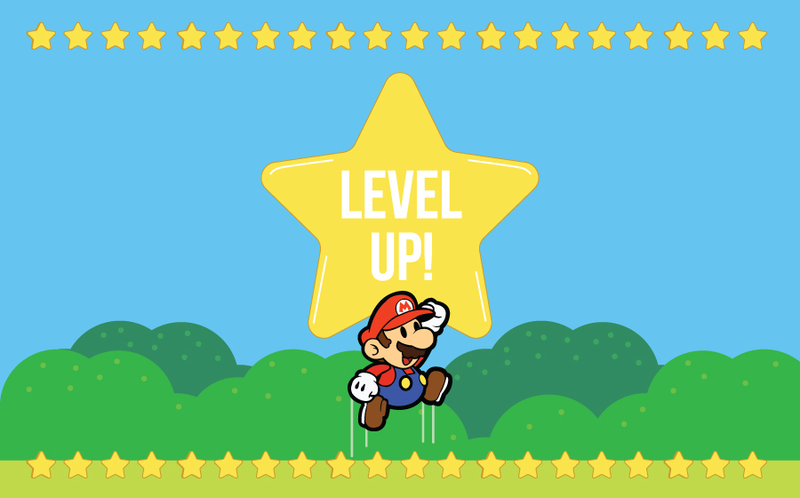 Earning XP leads to a student “leveling up”. A student’s level becomes a short-hand for growth as well as how much further they need to grow in the class. Here is the level conversion page in my gradebook – Level Grade Page in XP Gradebook – and here is a screencap. XP levels are in column A. The corresponding Level is in Column B. Column D is a quick graphic that will show up on the student’s personalized gradesheet. The orange table is the minimum level (column H) needed for each Letter Grade (Column J). The really neat thing is that I’ve learned how to automate all of the calculations! There are practicalities that creep into every classroom and every grading system. District and state requirements must be accounted for. To throw out these requirements “for the kids” might actually have negative impacts on the students (see the scholarship money issue). Again, I am going to assume that all teachers are trying to do what is best for the kids and I hope that my readers will give the same courtesy. With that said, I believe that every grading system will vary to some degree. Here are some of the adjustments that I have made to mine. 10 point Letter Grade Scale – South Carolina just adopted a new letter grade scale – A=100-90 B=89-80 C=79-70 D=69-60 F=59 and below. This can be seen in the Level to Grade Scale table. The top level is 40 (well, students can go above level 40, but the top scoring level is 40). Level 24 is 60% of level 40 which translates to a D Letter grade. This means that the student has achieved 60% of the expected growth in the class curriculum. Mandatory US History and Constitution End of Course Exam which must count as 20% of the overall grade – This is the only calculation that I have for students. The “level grade” counts as 80% of the final grade and the Final Exam counts for 20%. 50-30-20 Category Weight Scale – Two years ago, my district’s new Superintendent mandated that all classrooms have a 50-30-20 grading category weighted grading scale. 50% of grades come from “Major Assessments”, 30% from “Mid-Level Assessments”, and 20% from “Practice Assessments”. Again, remember that intentions were good. At first I thought this would hamstring my XP System, but I was able to adapt. I decided to break down my assignments into “assignment types”. Here is what it looks like. Mid-Level and Practice Assessments are mastery-based learning assignments. See below for Major assessment issues. Main Missions, Side Missions, and other assignments have multiple variations. Students have a great deal of choice in their path towards level 40. In my Standard 2 Unit from last year students could select from the following activities. “Public History” ties into my Class Narrative. Students were required to select one of these assignments. They could complete multiple assignments for more XP if they wanted. In the Major Assessment Category my district requires (or “strongly suggests”?) that we participate in the common assessments for each standard. The good news is that these assessments are data. The bad news is that these are multiple choice exams. Again, being pragmatic, these are weighted heavily and I use these common assessments as “bosses” that my rewards/power cards can help to defeat. Students can also complete additional missions to make up for lost points in the common assessments. If you are interested in seeing my gradebook template follow this link. It is a heavily modified variation on a beta gradebook that Alice Keeler let me borrow. I am certain that I left something out of this discussion. I use badges so students can show their completed missions, I have been developing Avatars and Powercards which tie into the grades, and have developed a ranking system which uses XP as one of the benchmarks. I would be happy to answer any questions about or clear up any omissions from this post!